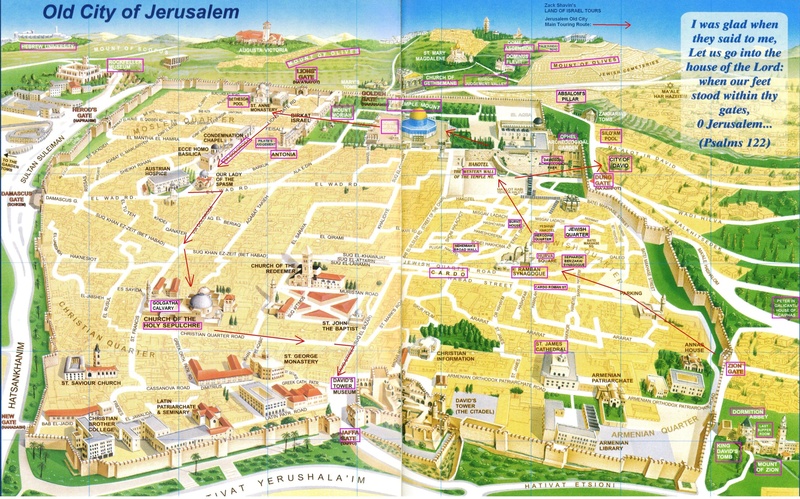 Touring map of Jerusalem Old City: Mount of Olives, Gethsemane, City of David, Mount Zion, Jewish Quarter, Last Supper, Wailing Wall, Temple Mount, Dome of the Rock, Via Dolorosa, Calvary, etc. Planning a trip to Israel? I hope this Jerusalem Map with Old City touring routes has been helpful. For more information please contact Zack Shavin, veteran guide & biblical archaeologist at Land of Israel Tours.